Here’s a publishing tip: Don’t go rooting around in Nazi propaganda for your stock photos. 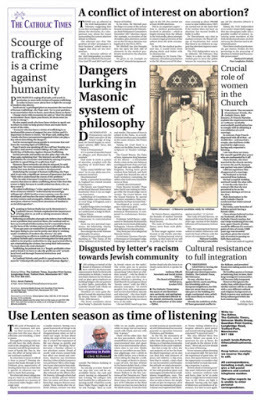 During the anti-Masonic media tumult in England in February, the Manchester, England-based Catholic Times newspaper decided to weigh in with their own take on Freemasonry by publishing a letter from one of their readers on the ‘Letters To The Editor’ page. Blaring the headline, ‘Dangers Lurking In Masonic System Of Philosophy,’the letter contained the usual array of canards against the fraternity. Given the Roman Catholic Church’s official strictures against joining Masonic lodges, that’s to be expected in a paper specifically skewed to that particular audience. If any organization has the right to create their own lopsided messaging that is specifically anti-Masonic in nature, it would certainly be the Catholic press, no matter how incorrect they might be. Unfortunately, the large graphic they chose to accompany the letter couldn’t have been a stupider choice. Immediately below the anti-Masonic letter was a different letter, this one a complaint that the paper had recently published blatantly anti-semitic material in an earlier issue. Anthony Silkoff, the Interfaith and Social Action officer of the Board of Deputies of British Jews wrote a strong objection to the Catholic Times about a different reader’s letter which had alleged “a dramatic increase in Jewish voices on the radio”, as well as complaining about a “Jewish comedian” using sexual slang. Mr. Silkoff described the original letter in the paper as “racist drivel,” and his message was printed on the same page as the anti-Masonic letter. Right under it, as a matter of fact. So what did the Catholic Times use to illustrate their reader’s takedown of the fraternity? A photo that’s appeared in books like The Hiram Key and others, and has been around since the 1940s. The man, blindfolded with his trouser leg rolled up, was standing in front of a door with two Stars of David above it. However, as Mr Silkoff highlighted, the picture of the man was taken from a Nazi-era antisemitic pamphlet about Jews using Freemasonry for subversion. In a second letter to the Catholic Times, Mr Silkoff wrote: “At best, this is an incredibly grave mistake for you to use this Nazi image, and especially to use it on the same page where you had to print an apology for antisemitism. Mr Silkoff told the JC: “This episode has caused such concern because the Board really values the strong relationship we have with Catholics in Britain. “We cooperate on lots of issues, particularly education and faith schools. He said he had found the image on Google and not checked its source. Ooops. Pesky details like that tend to reinforce the beliefs of Freemasons, especially in England and other European countries, that the press is never to be trusted. Just as a matter of reference, two recent surveys of U.S. and Canadian Freemasons have shown that as many as 23% of Masons in those two countries identify themselves as Catholic. The fraternity does not restrict Catholics from joining. On the contrary—Freemasons do not ask a petitioner or their own members what particular faith they espouse. These two surveys were anonymous and unofficial. Freemasonry is designed specifically NOT divide its members by religion, politics, race, economic class, or profession. As a result, when Speculative Freemasonry first became widely known in the first half of the 18th century, the lodge was the first organization of its kind in England where Catholics, Protestants, and Jews met and socialized side by side without discrimination. Apparently that is still considered a radical notion by a shrinking handful of people who just can’t contain their contempt for it to this day. Thanks Freemasons for dummies shared this article! Freemasons are meeting in the Houses of Parliament. How big a threat is that to our democracy? Oh well, this article is very informative. However, I haven’t yet been initiated, should I proceed with SHARING the article? Furthermore, I have a whole lot of questions regarding 1. Access to informations, can an apprentice, get access to all informations he wishes to apprehend? 2. Is Robert Lomas ideas about faiths, mostly the Christian faith widely approved? I am a man of purpose, vision and a long-deepen FATHERHOOD/SONSHIP Relationship with THE SUPREME BEING- ‘GOD’. I have been called and to be privileged to have been initiated to the realms of a seeker by the abundance thoughts in my spiritual and physical mind. Can such a man with purpose and ambition be supported and approved by the fraternity? Moreover, can a interested man pick a specific lodges or location to undergo the rituals or initiation?